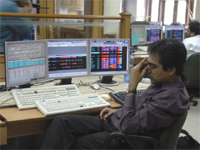 Mumbai: In a highly volatile trade, the Sensex Monday tumbled 244 points as RBI unexpectedly kept lending rates unchanged sparking off hectic selling, especially in interest-sensitive stocks banks, realty and auto. The BSE benchmark index, which breached the 17,000-level first time in six weeks in early trade today on expectations of rate cut and pro-bailout parties winning in Greek polls, fell sharply to end with a whopping loss of 244 points, or 1.44 percent to 16,705.83. In the 30-share index, 28 stocks ended with losses. Moving in a 400-point range, the Sensex which hit a high of 17,109.95 received a severe jolt as the RBI kept interest rates unchanged in its mid-term policy review, choosing to check inflation over growth.